The Parkland Shooting: Why Are Mass Killings So Common in the United States? On February 14, an American horror story played out in southeastern Florida when 19-year-old Nikolas Cruz opened fire at Stoneman Douglas High School, killing 17 people, including 14 students. In April 1999, the country was stunned by the mass killing of 13 students and teachers at Columbine High School in Colorado by two students, who then committed suicide. In the course of the past 20 years, eruptions of homicidal violence have become almost commonplace, and the death tolls resulting from such incidents have in many cases far exceeded the terrible loss of life at Columbine. The 2017 attack in Las Vegas resulted in 58 deaths. The 2016 attack at the Pulse nightclub in Florida left 49 dead. The 2014 shooting in San Bernardino cost the lives of 14 people. The 2012 assault at Sandy Hook Elementary School claimed 28 lives. The attack on an audience at a movie theater in Aurora, Colorado, also in 2012, took 12 lives. The shooting at the Fort Hood Army base in 2009 resulted in 13 deaths. The killings are not only deadlier than in 1999. Such incidents occur much more frequently. Mass killings involving more than four deaths take place every 16 days in the US, 10 times more frequently than in the period between 1982 and 2011, when the average time between mass killings was 200 days. Unlike in the aftermath of previous shootings, this time the usual hypocritical appeals for “unity” and “remembrance” have been accompanied by a groundswell of anger. Students have spoken out sharply against politicians, including President Trump, and walkout demonstrations involving thousands of students have occurred at high schools and middle schools across the country. The initial focus of the demonstrations has been on assault rifles, which have been used in numerous eruptions of homicidal violence. The fact that such weapons can be so easily obtained, even by youth with serious psychological disorders, is seen as an obvious expression of the irrationality of American society. The hatred of the fascistic National Rifle Association and the contempt for the politicians who take money from this reactionary organization is entirely legitimate. But the exclusive focus on guns—which has been encouraged by the media and the Democratic Party—runs the danger of becoming an evasion from the deeper causes of the Parkland tragedy. Horrific events like the Parkland shooting seize headlines, but such incidents represent only a tiny fraction of the extreme violence of American society. Since 2000, there have been 270,000 murders in the US, 600,000 drug overdoses (200,000 involving opioids), 650,000 suicides (130,000 by veterans), and 85,000 workplace deaths. An estimated 700,000 people have died prematurely during this period due to lack of health care. Police killed over 12,000 people from 2000 to 2014, and up to 27,000 immigrants have died attempting to cross the US-Mexico border since 1998. The government has executed roughly 850 prisoners since 2000. Over 2.2 million adults are currently incarcerated in jails and prisons, with another 4.7 million on probation or parole. There are two critical factors in the phenomenon of American violence. The first is the extreme level of social inequality. Wilkinson and Pickett demonstrate in The Spirit Level that countries with higher levels of inequality exhibit higher levels of violence. What, then, makes our society so violent? Research indicates that a principal driver is income inequality. In addition to being among the most violent of industrialized nations, ours is among the most unequal, with wealth being concentrated in the hands of a few. In highly unequal societies like the United States, crushing exploitation, unfair treatment by profit-hungry employers, a lack of access to social programs, increased competition and extreme economic stress push millions to the psychological breaking point. A second factor is, undoubtedly, the impact of unending war, waged by the United States all over the world, on American society. The “war on terror,” now in its 18th year, dominates not only the political life of the United States, but its social culture as well. A 17-year-old high school student has not lived a day in his or her life when the United States has not been at war. Under the auspices of the “war on terror,” the government has armed the police with military equipment as part of the development of a “total army.” It has advanced its war aims through the perpetual exacerbation of moods of extreme nationalism, violence, paranoia, xenophobia, fear, suspicion and alienation. Worst of all, the number of people killed by the military forces of the United States in Iraq, Afghanistan, Libya, Yemen, Syria, Somalia and Pakistan is in the hundreds of thousands. To claim that the ongoing state of permanent war and mass surveillance has had no effect on the social psychology of the country is untenable. 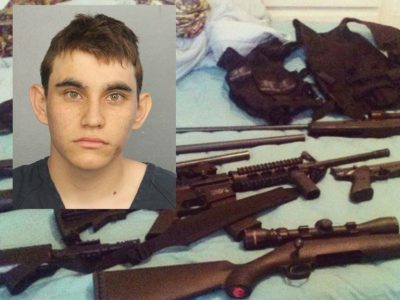 In Cruz’s case, the 19-year-old reportedly sported his Junior Reserve Officers’ Training Corps (ROTC) shirt as he unloaded clip after clip into the bodies of his former classmates and teachers. As always when sections of the population attempt to assert their social grievances, the political establishment has mobilized to manipulate popular aspirations and channel protests in reactionary directions. One faction of the ruling class has responded to the shooting by calling for more guns in schools. On Wednesday, Trump proposed to arm school teachers so they can kill potential shooters. The local sheriff in Parkland announced that all schools in the area will be occupied by police armed with AR-15 semi-automatic assault rifles, the same weapon used by Cruz. The Democratic Party has intervened to orient public debate behind gun control, seizing on popular hostility to groups like the fascistic National Rifle Association (NRA) that have profited from the nearly unrestricted proliferation of military-grade weapons. Though a law limiting the availability of assault rifles might reduce the number of deaths when shootings occur, it would not address the underlying causes of social violence. Other, and, one has reason to suspect, even more lethal means of destroying lives will be found. The root cause of such violence lies in the capitalist social system, based on ever-intensifying corporate exploitation, inequality, and war. This nightmarish American reality will be brought to an end only when capitalism is ended and replaced by socialism. The International Youth and Students for Social Equality warns that protests addressed to the Democratic and Republican Parties will fall on deaf ears. Students and youth must turn to the working class, the great progressive and revolutionary social force.